Figure 1. Left: Compressed laminated wood (Source). Right: The Pioneer Knutsen, a LNG tanker which uses compressed laminated wood to support its LNG tanks (Source). Compressed laminated wood is a specialized wood composite material used in industries where an inexpensive, strong, relatively lightweight, thermally and electrically insulating material is desirable. Compared with raw wood, compressed laminated wood is stronger and more consistent in its mechanical and physical properties. Owing to its high compressive strength, low specific weight, water resistance, low thermal conductivity, low coefficient of friction, good temperature stability, and low coefficient of linear thermal expansion, compressed laminated wood is often the material of choice for mechanical support and thermal insulation in cryogenic applications, including liquified petroleum gas (LPG) and liquified natural gas (LNG) tankers. Compressed laminated wood is typically the material of choice for the mechanical support parts which hold the tank in place and physically support it inside of the ship hold (Figure 1). Figure 2. An anisotropic sample is one which may have different properties in two or more of the directions indicated. Owing to its construction, where thin panels of wood are laminated together under heat and pressure, compressed laminated wood has an asymmetric structure – that is to say its composition and structure vary in a direction-dependent way. 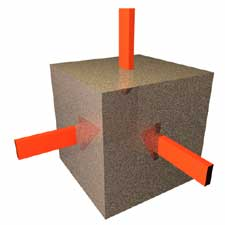 Materials with this sort of structure are called anisotropic (Figure 2). Figure 3. Compressed laminated wood sample being tested in-plane using the C-Therm TCi Thermal Conductivity Analyzer. Recently, a prospective TCi client wanted to better understand the thermal conductivity of their wood samples and to know how the structural anisotropy translates to thermal anisotropy. To find out, a sample piece of compressed laminated wood was tested both in the in-plane and in the through-plane directions. 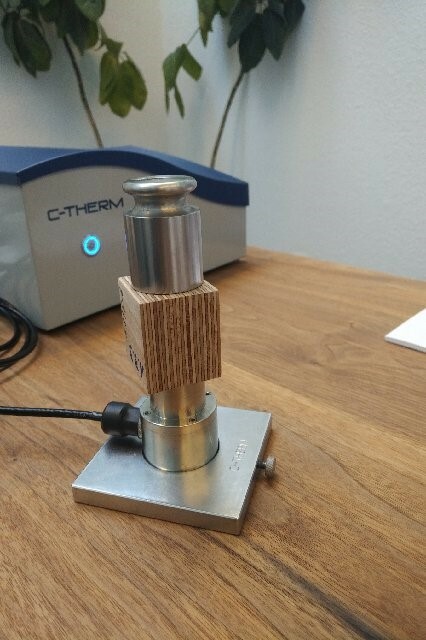 The MTPS (modified transient plane source) technique employed by the C-Therm TCi Thermal Conductivity Analyzer uses a patented Guard Ring technology which results in a one-directional heat flow and, thus, optimized for measuring the thermal conductivity measurement of such samples. This enables easy measurement of anisotropic materials by positioning the sensor along different surfaces of a material to obtain direct measurement of the thermal conductivity anisotropy. This testing was completed in a straightforward manner, by placing the sample on top of the sensor to test the thermal conductivity in the direction perpendicular to the sensor surface (Figure 3). Figure 4. Thermal conductivity anisotropy of compressed laminated wood sample. Error bars equal to the standard deviation are shown to illustrate the precision. Figure 4 illustrates the thermal conductivity of these samples. The error bars indicate the variability in the test data – In the through-plane direction, this was 0.4% of the overall measurement. The in-plane direction exhibited more variability, but was still very precise at 1.5%. For more information on testing the thermal conductivity of compressed wood and other anisotropic samples please visit here. Comment on "Anisotropic Thermal Conductivity Testing of Compressed Laminated Wood"